Game B: If your present capital is a multiple of 3, you toss coin 2. If not, you toss coin 3. In both cases, you receive 1€ if coin comes up head and lose 1€ if not. Played separately, both games are quite unfavorable. Now let’s define Game A+B in which you toss a balanced coin and if it comes up head, you play Game A and play Game B otherwise. In other words, in Game A+B you decide between playing Game A or Game B randomly. 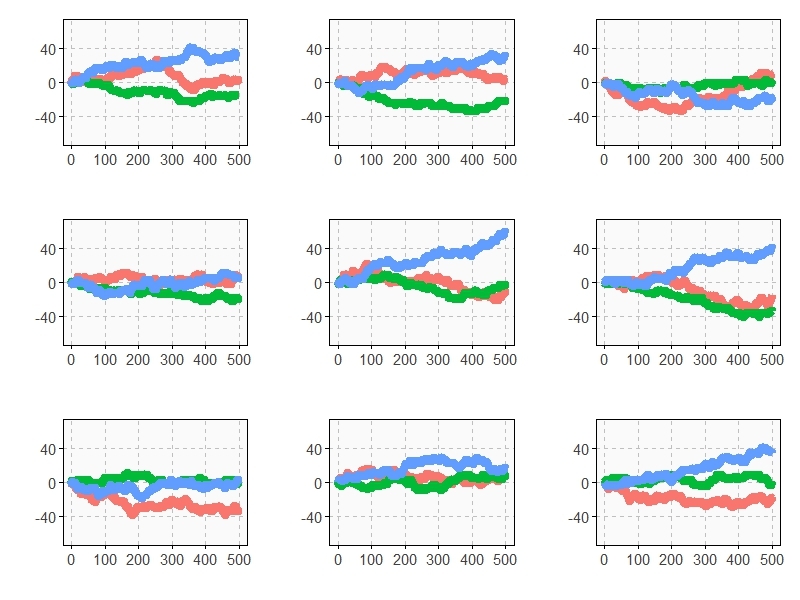 As you can see, Game A+B is the most profitable in almost all the previous simulations. Coincidence? Not at all. 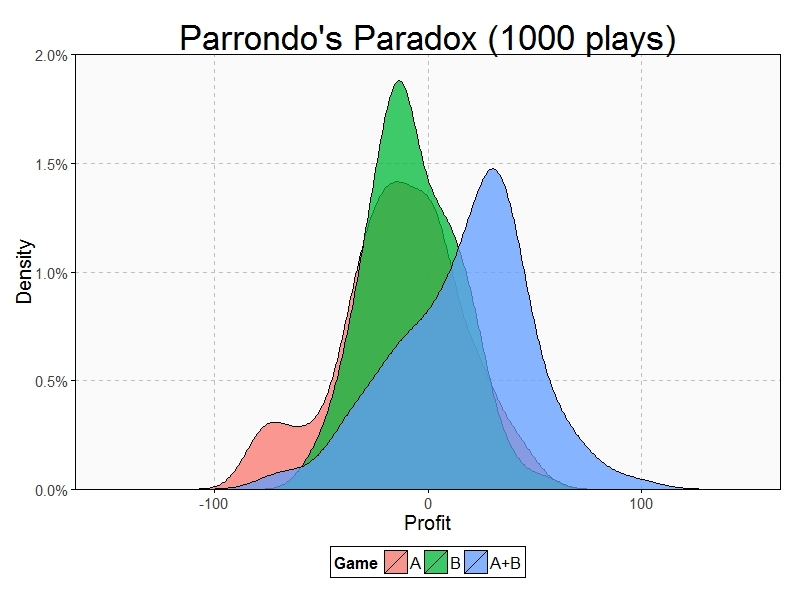 This is a consequence of the stunning Parrondo’s Paradox which states that two losing games can combine into a winning one. 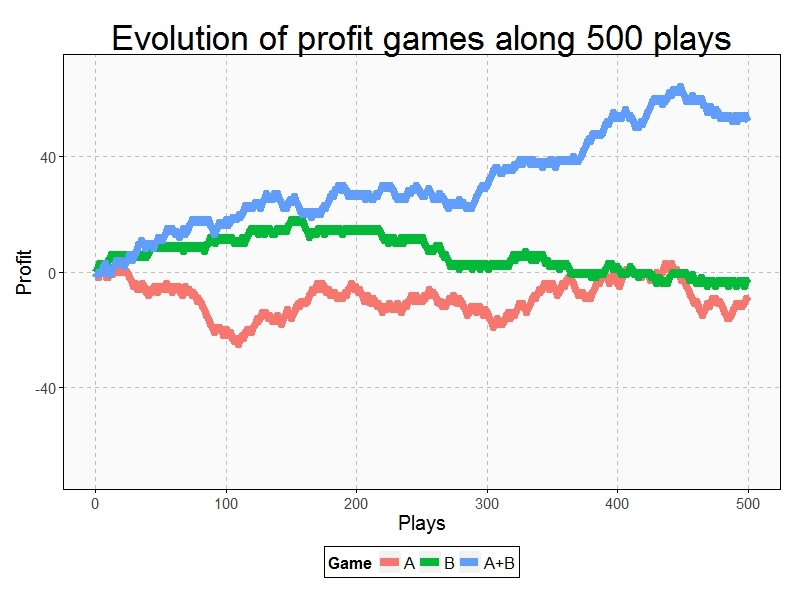 After 1000 plays, mean profit of Game A is -13€, is -7€ for Game B and 17€ for Game A+B. I’d be careful here. Profits are the result of humans gaming a system which abides by fungible rules; fungible by these same humans. The rules aren’t God, Nature, physics, mathematical physics, Newton, or Einstein. The Great Recession is the most recent example of how rule changing/breaking determines the outcome. The implementation of Game B (Line 18) tosses the second coin (biased towards heads) more (2/3 of the time), which makes the result less paradoxical. Game B only tosses the coin 2 when profit is multiple of three. Otherwise, tosses coin 3 which is extremely biased to tail. Game B tosses more times an extremely ‘bad’ coin rather than a significantly ‘good’ one. This is why (qualitatively) Game B results unfavorable. This paradox is wonderful. I enjoyed your links. Thank you.